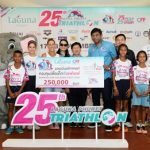 Sweden’s Fredrik Croneborg, finished first and gave Laguna Phuket Triathlon (LPT) first Swede champion in its 25-year history. In 02:21:39 hours, Croneborg claimed his title less than 2 minutes before his toughest contender Bart Aernouts (Belgium), who recently took 2nd place on the podium at the World Championship in Kona. Followed in 3rd was Per Van Vlerken of Germany, timed 02:24:02. 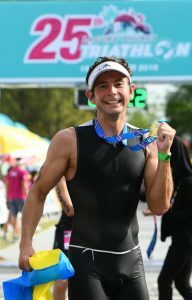 Also racing with bib number 1 to honour his 4-time LPT title was Massimo Cigana of Italy who came in 4th at 02:27:00 as the crowd cheered on a field of more than 1,000 triathletes, represented 50 countries in the unique destination distance of 1.8K swim, 50K bike and 12K run, with USD 20,000 prize purse.